We had our first frost on Saturday morning, I was happy to wake and see this. I had decided that I did not want the plactranthus for next summer so I left them out to end their life. I feel now that it was a little hard of me and so am going to get a few cutting, maybe it is a little too late. We now have some space up in the vegetable garden ready to be dug. I have gone through and taken out any crops that have gone over. I hope to be able to start digging over next week. I am really hoping that the seed of this parsnip is going to develop a little more before the weather gets too cold. After my self seeding peas I want to be better about collecting my own seed. Today I ate fresh peas from the garden. I do not think that is at all bad for the middle of November. I did not plant the peas, they are self sowers from the crop I had there in the summer. I am not sure it is a sign of a mild autumn or great soil, maybe both. 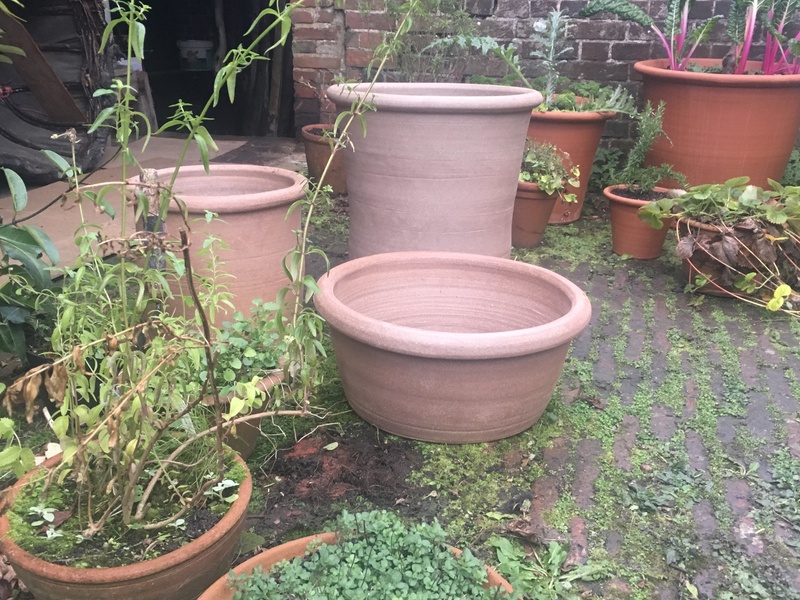 Luciano told me about a local potter on the weekend so I telephoned him on Monday and asked if I could come and see his pots with the hope of getting some for the kitchen yard. Today I went and had a look and was very happy with his work, I now have new pots in the yard. It is great to arrive somewhere when it is dark because you do not know what is going to be your view from the bedroom window. I was not disappointed on the weekend to wake and see from the bedroom window that my view was onto the vegetable garden. My friend Kate is doing a great job of her vegetable garden. Kate’s place as a whole is pure joy and perfection.